Trent begins to suspect his father Anton Mercer's motives when strange things begin to happen. 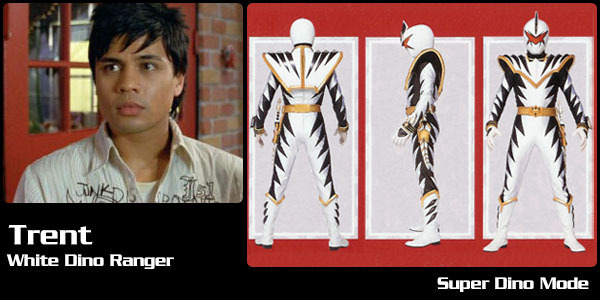 When Trent finds a Dino Gem posessed by evil, he is transformed into the evil White Ranger. He joins his father Mesogog in the battle against the Power Rangers. His Dino Gem gives him the power to camouflage himself into any environment. He has the power of the Dragozord at his disposal. After the evil of his Dino Gem is destroyed, Trent joins the other Power Rangers. However, he promises to keep his father's secret as Mesogog, while Anton finds a way to return himself to normal. Trent finds himself battling his past when he must face an evil clone of the White Ranger. There is a power struggle within the Morphing Grid of who will survive as the White Ranger. Trent overcomes his dark past and defeats the evil White Ranger clone once and for all. When the other Rangers find out that Trent is keeping Anton's secret as Mesogog, they become enraged. He comes clean with them and must prove to them his loyalty to the team. He helps the other Rangers infiltrate the Island Fortress to take down Mesogog. Meanwhile, Trent stands up to Mesogog and rescues his father from his clutches. Trent used up the remainder of his Dino Gem energy in the final battle against Mesogog. He later goes on to attend art school. Backed by his father Anton Mercer and famous comic book artist Carson Daily, Trent may have a future in drawing comics.